Geez, the lazy "reboot" hack generation just get sillier and sillier. 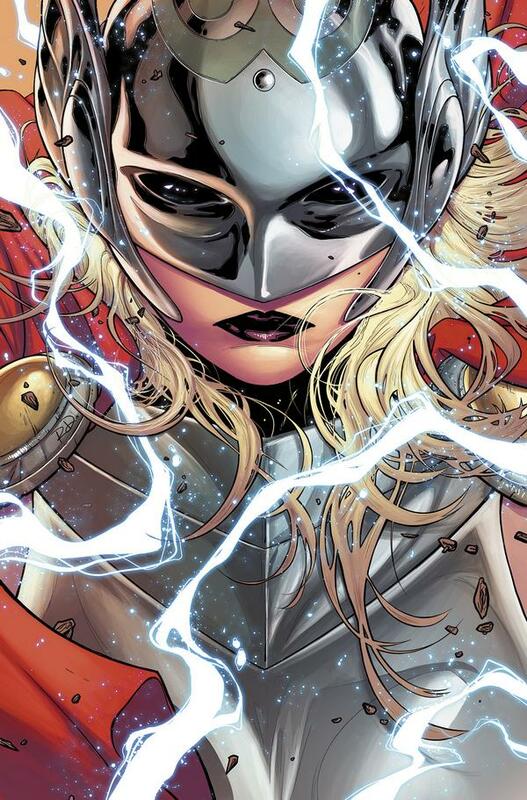 Now Thor, God of Thunder, is female. 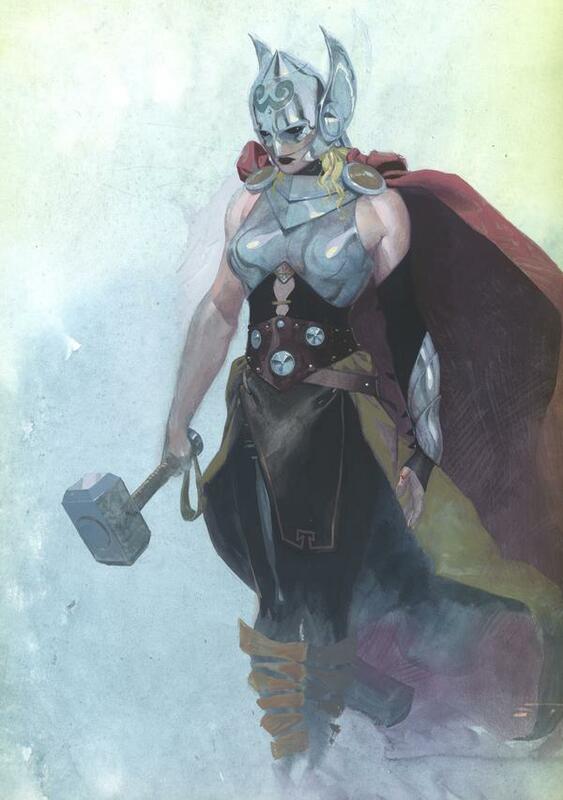 Marvel Comics has revealed this morning that come this October, Thor will no longer be worthy to wield the power of Mjölnir, and instead an all new female Thor will pick up the hammer and take his place as the God of Thunder. The new series, simply titled Thor, will be written by Jason Aaron (Thor: God of Thunder, Original Sin) with art from Russell Dauterman (Cyclops). Check out the cover art and images of the character below. Will you be picking up Thor #1 this fall? .. is this really any sillier than a 'worthy' extraterrestrial becoming Thor -- or having Thor himself, enchanted into a frog by Loki, still able to wield his powers in frog form..? Those happened back when I was a teenager .. and -- while there was much actual 'silliness' on a surface level -- both of these storylines were AWESOME, and are now widely looked-back-upon as 'classic' moments in the series. That's not to say that this current gimmick will see the same result .. just that: at the very least, conclusions about a female Thor are perhaps best drawn after actually reading the story. Those are silly ideas, but at least they were temporary (as far as I know). This latest idiocy is permanent ... or as permanent as any comic book is before yet another silly "reboot" comes along, and just more proof that almost the entire entertainment industry has completely lost the ability to come up with good or senisible new ideas. C'mon, it's bad enough every time DC makes a big press statement about some summer or limited-issue storyline stunt, and then all the mainstream folk think "OMG, they're changing the character forever! " Although I suspect this one was cashing in on various original female-Thor cosplay at the SDCC, and "if you can't beat 'em, join 'em". Granted, Buzz Bumble -- the frog storyline was a 3-issue arc, but the 'Beta Ray Bill-as-Thor' story lasted nearly a full year .. and BRB proved to be so popular with readers that he was given an enchanted hammer of his own, and was made a separate 'permanent' character in his own right. Which -- despite the statements by the Marvel editor in your initial post -- I fully expect to be the eventual fate of this female incarnation of Thor. As EricJ has just pointed out: by the time Marvel Studios is set to release their next live-action Thor sequel (starring Chris Hemsworth), the comic book will almost certainly restore the character to his traditional form. In the meantime -- why begrudge the comics editors the chance to try something new and different with an 'established' character..? After 52 years, it gets a bit tougher to find something you haven't done before. Like I'd said, this is a gimmick -- and, like you'd said, this is hardly 'permanent'. Neither of those means it has to necessarily be 'bad'. I read somewhere that the reason they were doing this was to "bring more girls and women to comic books." I would have thought - and my wife validated - that it would have brought more girls and women if Thor stayed the way he was ...!! The way they draw female characters is purely for 13 year old boys (either physical or mental age). They certainly aren't going to gain many female fans from this gender switch. Such ideas usually come from brainless people in management. Chris Hemsworth mentioned how he felt about Thor becoming a woman in the comics during the PACKED Marvel Studios panel at Comic Con 2014. A glorious response, if you ask me.